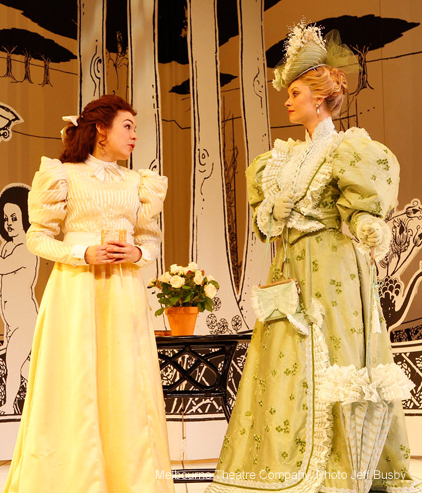 Of the many famous lines and hilarious moments in The Importance of Being Earnest, several of them revolve around food. 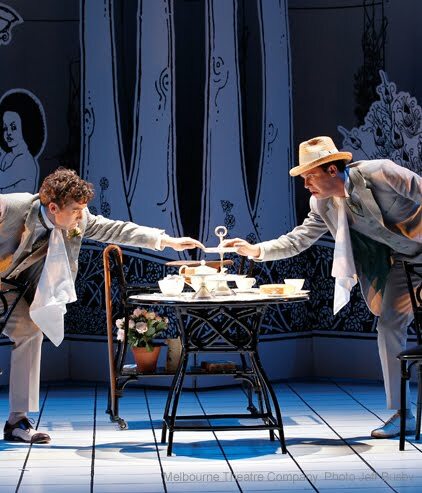 The sight of Algernon consuming an entire plate of cucumber sandwiches and then feigning outrage at there being none left when Lady Bracknell arrives for tea; Cecily serving Gwendolen an enormous slice of cake when she requests bread and butter; Algernon’s disagreement with Jack about the appropriate circumstances in which to consume muffins… all of them give our cast plenty of scope for both verbal and physical comedy. For Next to Normal earlier this year, the sheer volume of bread and fillings that had to be flung about in each show about meant that we couldn’t possibly use fresh ingredients every day. But in Earnest, there is such continuous consumption of food throughout the show that we couldn’t possibly fake it – and so it is that cucumber sandwiches, sponge cake, and muffins are diligently prepared for each performance by our stage management team and HQ catering team, served up with the comic genius of Bob Hornery as Lane/Merriman, and then dealt with by our cast. Our Assistant Stage Manager Vivienne whips up the cucumber sandwiches each day – just two slices of buttered bread with one slice of cucumber between them. To make them any more substantial would be cruel, since our Algernon, Patrick Brammall, must consume seven of them in the space of about 10 minutes in every performance – that’s just over 480 cucumber sandwiches by the end of the season! Cecily: [Severely.] Cake or bread and butter? Gwendolen: [In a bored manner.] Bread and butter, please. Cake is rarely seen at the best houses nowadays. Cecily: [Cuts a very large slice of cake, and puts it on the tray.] Hand that to Miss Fairfax. The only food we don’t make in-house is the sponge cake you see in Act Two. By the end of the season, around 70 sponge cakes will have been haughtily hacked up and handed to ‘Good Heavens Gwendolen’ (Christie Whelan) by a delightfully pouty Cecily (Emily Barclay), in one of the finest and most thinly veiled female spats ever to grace the stage. Jack: How can you sit there, calmly eating muffins when we are in this horrible trouble, I can’t make out. You seem to me to be perfectly heartless. Algernon: Well, I can’t eat muffins in an agitated manner. The butter would probably get on my cuffs. One should always eat muffins quite calmly. It is the only way to eat them. Our deputy caterer Anita takes care of the ‘muffins’ – which are actually friands, because they are much lighter, and easier for our cast to swallow. Just egg white, butter, icing sugar and almond meal – that’s it. Sadly, due to the fervour of Algernon and Jack’s disagreement about muffin etiquette, most of the muffins end up on the floor, but that’s not to say we don’t appreciate your efforts Anita! There’s the same number of muffins as sandwiches in the show – so that’s another 480 by the end of the season. Merriman always has the last bite – pinching the final muffin from Jack at the end of the scene. 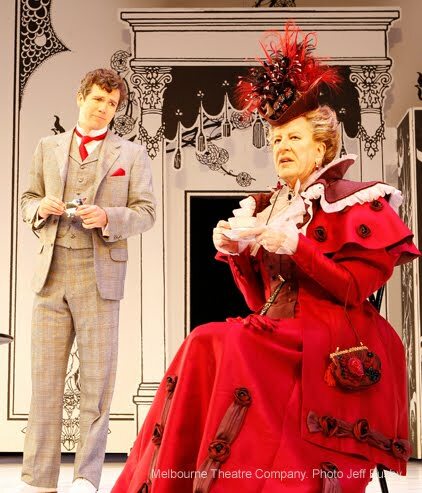 What are your favourite moments in The Importance of Being Earnest? We’d love you to share them in the comments below.